Remove the scales of the fish. Debone. Cut fish into butterfly fillets. Cut into serving pieces. Add salt and allow to saturate for 1 hour. Add angkak to cooked rice. Mix 400 grams salted fish and 850 grams cooked rice. Pack rice and fish alternately in sterilized glass jar. 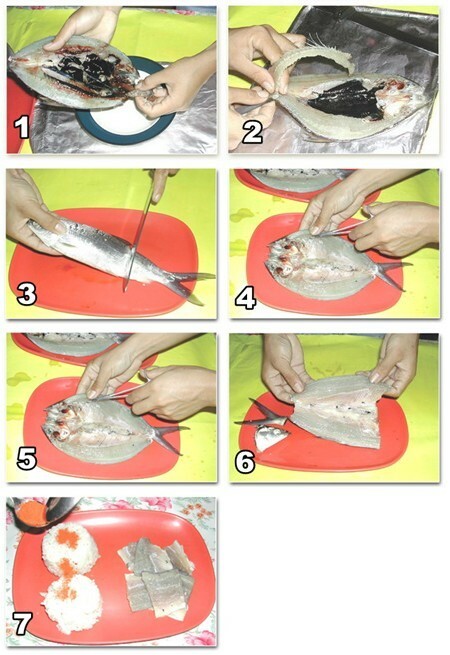 Place the remaining rice on the upper layer of fish. Ferment for 7 days at room temperature. Saute in cooking oil, garlic and onions before serving.